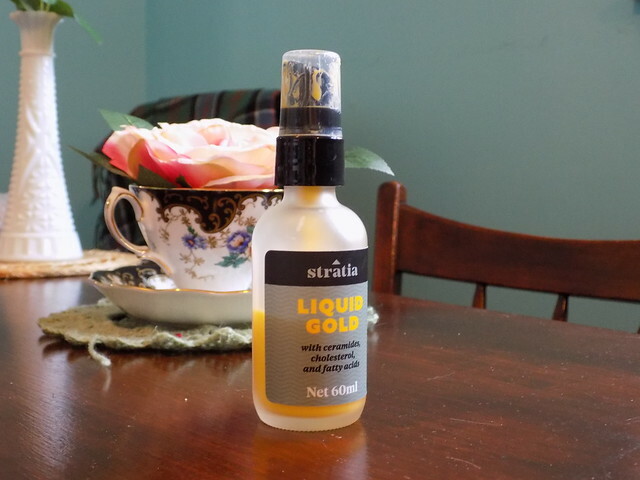 I am going to start by saying that I know I am not doing anything ground-breaking by reviewing Stratia’s Liquid Gold. But I wanted to share my experiences with it, because I have tried a few ceramide products. But the bottom line is that I really like this product and I don’t see myself finding a replacement any time soon. Because I haven’t talked about my skincare routine for a while, here are the cliffs notes: I have combination dehydrated skin that I’m coming to realize is actually a bit sensitive. My skin hates soap, heavy plant butters, coconut oil, and cinnamon, and it loves low-pH cleansers, light hydration, high-linoleic oils, and ceramides. I started out with CeraVe PM as my ceramide fix, and later moved on to Rosette Ceramide Gel and finally CeraVe Baby Moisturizing Cream. And then I decided to use Liquid Gold. At the time, the product mostly replaced three products in my routine: a niacinamide serum, a facial oil, and a ceramide cream. I’ve actually found myself reaching for my beloved Herbivore Phoenix oil less and less because Liquid Gold has the lovely nourishing plant oils, along with a healthy dose of niacinamide, hydration, and ceramides. The cream itself is a lovely golden yellow color and has no discernible scent, other than the natural scent of the oils, which some people think smell fishy, but I just smell oil. It’s a creamy emulsion consistency, like a loose custard, which I find delightful, particularly together with the vivid color. Cosmetically, it is a joy to use. The sturdy, frosted-glass bottle looks lovely on my vanity, is distinctive enough that I can send Fiancé into the other room to get it for me with a 100% success rate, and the pump dispenses the perfect amount for the morning. In the evening, I use two pumps, although I sometimes add a thicker occlusive on top. I use this product as either my last step in the morning before I put on sunscreen and makeup or as my last step in the evening, possibly before an occlusive or sleeping mask. When the air is not very dry, or when I’ve just used a sheet mask, I sometimes find it enough on its own. It applies smoothly, and leaves a satiny finish to my skin. There is a very slightly amount of stick, but just enough that my skin feels moist. It really does feel a bit like fresh mochi when I touch it! Since I started using this product, the improvements to my skin have been subtle. Of course, from the first night I tried it, I woke up to glowing skin the next morning. But I’ve already made great strides by removing pore-clogging ingredients, switching to a low-pH cleanser, and adding layers of light hydration. That said, I still had some residual breakouts along my jawline, particularly around my time of the month. Well, last month, my monthly visitor was late, and because of that, and the fact that I hadn’t gotten even one spot convinced me that I was expecting. I mean, my skin was glowing. Of course, it was a false alarm, but the only thing that I had started recently enough to be the “culprit” would be this lovely healing emulsion. If you are in the market for a light, hydrating and emollient, ceramide moisturizer, I suggest you take a look at Stratia Liquid Gold. It is worth at least a look, although it does contain some ingredients that give others pause. But I have found it to have made a great positive difference in my skin. NB: I was not compensated in any way for this review or provided the product for review. I paid for this product with my own money.